How Does Water Injection Work? 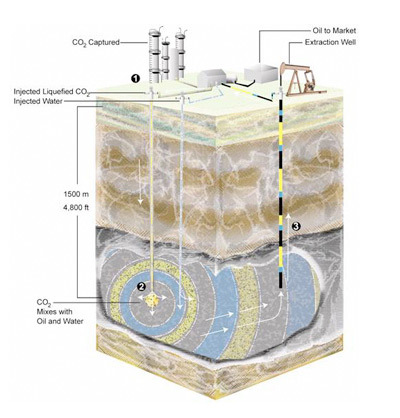 While primary production refers to oil that is recovered naturally from a producing well, Enhanced Oil Recovery (EOR) improves the amount of oil recovered from a well by using some form of additional engineering technique. 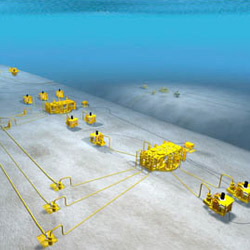 Water injection, also known as waterflood, is a form of this secondary EOR production process. Used in onshore and offshore developments, water injection involves drilling injection wells into a reservoir and introducing water into that reservoir to encourage oil production. While the injected water helps to increase depleted pressure within the reservoir, it also helps to move the oil in place. Whether water injection occurs after production has already been depleted or before production from the reservoir has been drained, waterflood sweeps remaining oil through the reservoir to production wells, where it can be recovered. The water used for water injection is usually some sort of brine, but it can also be made up of other sources that are treated. For example, in some reservoirs water is produced with the hydrocarbons, removed from the production and re-injected into the formation. It is important that the water being injected works within the formation. Filtration and processing of the water that will be injected are sometimes necessary to ensure that no materials clog the well pores and that bacteria is not permitted to grow. In an effort to reduce any corrosion within the reservoir, oxygen is often removed from the water, as well. While production wells can be converted into injection wells, water-injection wells are also drilled specifically for this purpose. Water is then pumped into the reservoir, or gravity can help to push the liquid into the formation. This solution positions water tanks on hills or somewhere above the well, and the water simply is fed into the wellbore. There are a number of techniques for determining where the water-injection wells should be drilled, as well as established patterns for water-injection wells in relation to production wells. One popular pattern, called the five-spot pattern, involves drilling four water-injection wells in a square around a production well. This is repeated around each production well on the reservoir, resulting in four production wells surrounding each water-injection well, as well. 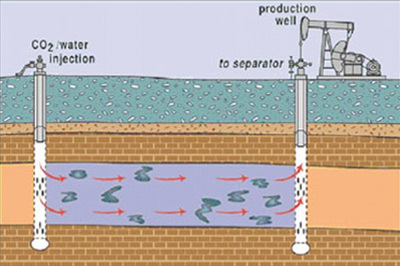 Other drilling techniques include the seven-spot pattern, which has six water-injection wells surrounding a production well, and the inverted seven-spot pattern, which describes six production wells surrounding one water-injection well. Also, wells can be drilled in line patterns, rather than spot patterns, where a direct line or staggered line of production wells is followed by a similar line of water-injection wells, and so on. In an edge waterflood, water-injection wells are drilled along the outside borders of the field, and water is injected, with production flowing toward the production wells in the center of the reservoir. Primary production usually only recovers some 30 to 35% of the oil in place. Although the effectiveness of water injection varies according to the formation characteristics, a waterflood can recover anywhere from 5% to 50% of the oil that is remaining in the reservoir, greatly enhancing the productivity and economics of the development. Another form of water injection involves introducing heated water into the reservoir. This helps to make the oil more fluid, especially in reservoirs that contain heavy oil. Also, the water can be treated with polymers to increase the viscosity of the water and help to encourage oil movement within the reservoir.